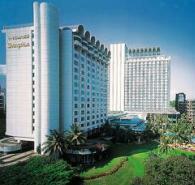 The Shangri-La Hotel is located in the center of the city-state of Singapore in Southeast Asia. The hotel is a 25-minute commute from Changi International Airport. Singapore River runs through the city, and river taxis are available. Orchard Road offers a variety of department stores, souvenir shops and malls. Sentosa Island is connected to Singapore by a causeway and cable car, and offers attractions including a zoo, water rides and a golf course.